The group, members of Kentuckians for the Commonwealth, gathered this morning at the office of the pro-coal governor, a Democrat, in an attempt to persuade Beshear to change his position on mountaintop removal coal mining. 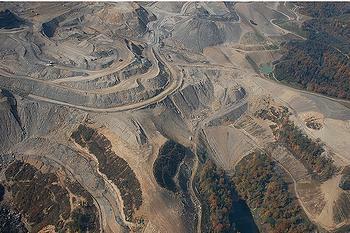 To get at coal seams, coal companies blast away the tops of mountains. Machines scoop out the coal, dumping millions of tons of waste rock into the adjacent valleys. More than 1,200 miles of Appalachian headwaters streams have been buried with valley fills, some leaching contaminants into the environment. 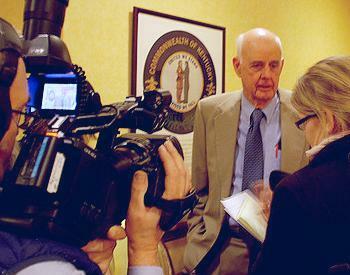 Some 20 demonstrators met with Governor Beshear today, but expressed disappointment in the outcome of that meeting. 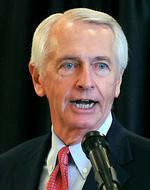 Governor Beshear told the demonstrators that he believes surface mining can be done “in a responsible way” that reclaims the land and protects waterways. Beshear is up for re-election this year and is under pressure from potential Republican opponents to support the coal industry. In his State of the Commonwealth speech on February 2, Beshear said he would fight the federal government for the survival of Kentucky’s coal industry, which provides 90 percent of Kentucky’s electricity and supports about 18,000 jobs in the state. The protesters want the governor to accept a long-standing invitation to view the devastating effects of mountaintop removal mining in eastern Kentucky. The federal Office of Surface Mining is in the process of developing a new stream protection rule that would address the damage mountaintop removal mining does to waterways. Office of Surface Mining Director Joe Pizarchik told reporters on a teleconference today that the new rule will replace the stream buffer rule put in under the Bush administration. Pizarchik pointed to better constructed valley fills where the waste rock, or spoil, is transported, rather than shoved, to the bottom, minimizing the impact and the substances discharged into the water. Leaked versions of a Draft Environmental Impact Statement on the new stream protection rule that predicted the loss of thousands of jobs were not accurate and had not been approved, said Pizarchik. His office will release an official DEIS for public comment later this year. The protesters are staying in Governor Beshear’s office in anticipation of I Love Mountains Day on Monday, an annual rally held to draw attention to mountaintop removal and the state Stream Saver Bill, which the protesters say has “languished” for six years in the Kentucky Legislature’s House Natural Resources Committee. “We invite our fellow Kentuckians to join us in solidarity on the steps of the Capitol on Monday,” said the group in its statement. A march to the rally from the Kentucky River Bridge will begin at 11:30 am.